To help us keep track of current wrapped vehicles I decided to start this new thread. 7865 is wrapped in an awful pink livery with a doritos bag of chips and a slogan on all sides of the bus "which way will you go". 7457 is also wrapped for Doritos. It was on 97B yesterday as reported by BC Transit. 2262 is wrapped for Bell, on 96. 7970 is also wrapped for Bell, on 107B. 2477 on 130, transferred fto Malvern. It was previously at Wilson. 2835 and 2846 were in service. I am sure there is at least one in 77XX and 78XX has the bell wrap as well. Yes there are. infact there are 6 in the 7700s (7741, 7751, 7760, 7781, 7783 & 7788) and 6 in the 7800s (7823, 7837, 7843, 7870, 7871 & 7874). There are a total of 86 known buses with bell wraps. Spotted 4120 today on 511, with a wrap for Nestea. Click links below to view pics. that reminds me 4230 has the nissan wrap still. St. George Stn. is already wrapped for Global, and as usual, it is already falling victim to vandalizing. The wrap is pretty disappointing though. Prison Break was all over the place, the only wraps I spotted there other than Prison Break were for Shark and Global National. 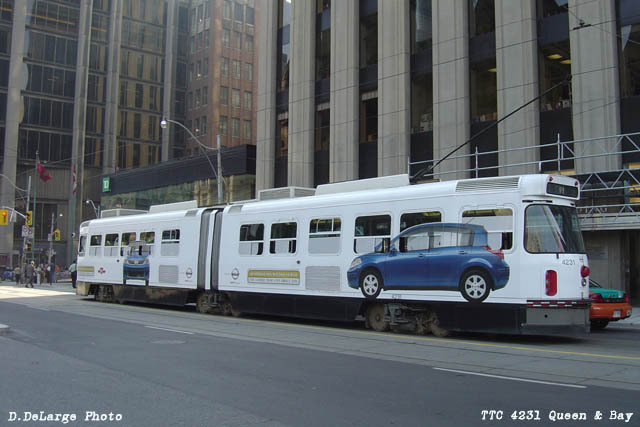 Damnit, STM_5307 and I didn't catch any full length bus wrap ads while in Toronto, whereas we saw many rear ads. We also noticed the St George Global ad... I thought it was in poor taste. 4231 is the car with the Nissan wrap. Union Station is also wrapped to a lesser extent. Seems like it's always St. George which gets shafted with the ad vandalism...then again Union is a pretty busy station and not nearly as big at St. George. Interesting. Last Year St. George was wrapped for Global around the same time as this year. I remember it was wrapped overnight between September 10th and 11th. I was there with you, it was a T1 and it was raining that day! I think you took a picture! 4120 wrapped for Neslea on the 505 today. 7929 has the Doritos wrap. Spotted it on Sheppard approching Bathurst this afternoon. 5196-97 (Garnier) were in service today. The St. George Stn. wall wraps change each night for the next show, Monday was all for Prison Break, yesterday for House, and today, the walls are half Simpsons and half Family Guy. 7928 wrapped in the oh so pleasant and eye appealing, puke, green Cheetos, Doritos or whatever the heck it is they're promoting. Who comes up with these sick colors? although I suppose it is slightly more palatable than the wussy, pink one. 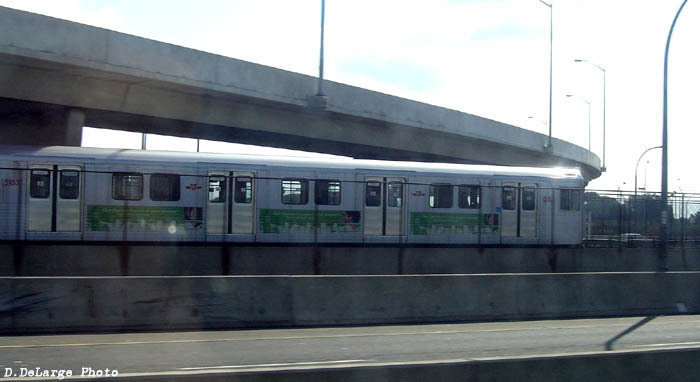 TTC 4231 with the Nissan Versa wrap on the 501 today. How comes you never see any 91 V's or classics with wraps no more? 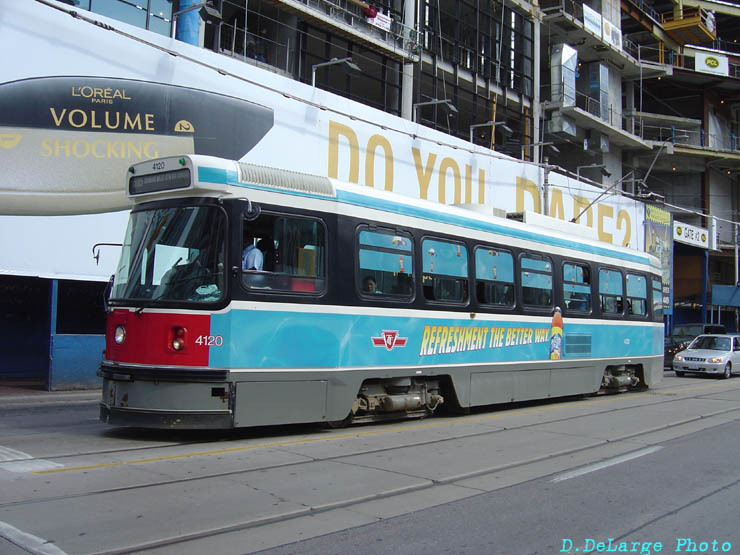 Streetcars aren't based strictly out of divisions like buses or trains. - 7754 and 7850 have been wrapped for Centennial College. The wrap is located only on the left sides, and the wrap is different than the last year ones. 7754 is on the 54, and 7850 was on 23 today. - 7538 has the Doritios wrap. 7538 is at Eglinton Garage. 7577 was on the 84. - 5182-83 (Garnier) is at Davisville Yard. Its in service for PM rush.